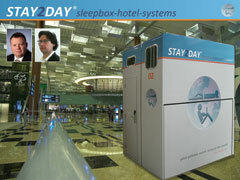 High comfort and versatility in a small space are the concepts on which the STAY2DAY Hotel are based. A box consists of two completely separate and independent units which are arranged one above the other. Both are equipped with a changing area, a mattress, shelves and various technical connections. The two units are designed so that the mattresses in the upper and lower units are positioned above one another, thus minimising space requirements. However, both units are soundproofed to guarantee complete tranquility for guests. The units provide flexibility. For instance, there are two options for the position of the entrance door. Furthermore, two units can be directly connected with one another to create a double box. Size changes are also possible if required. The existing two-unit boxes can, if necessary, be expanded with a sanitary unit (WC and shower) which can be positioned between two boxes for use by four units. In a general room arrangement, the boxes can either be set up individually or as a series, positioned either against a wall or free-standing units, thus optimising available floor space. 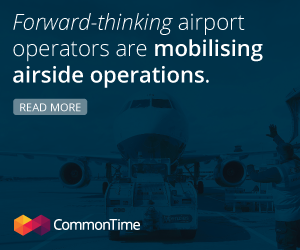 Come and visit us at the Inter-Airport Trade Fair in Munich (Oct 8-11) – Stand 914 Halle B5.